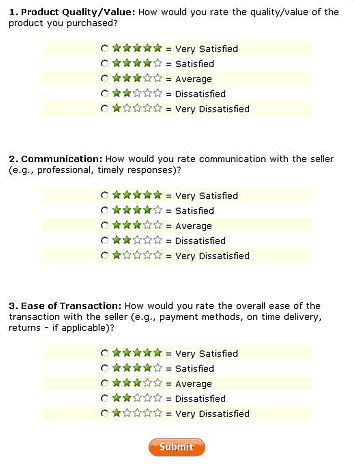 Do all sellers have ratings? 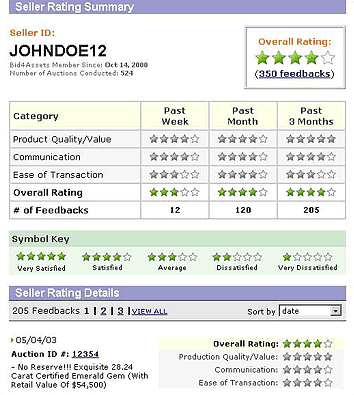 Every seller on Bid4Assets displays a Seller Rating Profile next to their name on any auction they list. This profile is made up of feedback from Bid4Assets buyers. This means that the seller has an overall four-star rating (buyers are satisfied) and has received 124 feedback ratings to date. This means the seller has not been rated as of yet. This means that the seller is either a government agency or a 501(c)(3) organization. Where do I go to rate a seller? A link to rate the seller for an auction you have won can be found in the winning bidder notification you receive following the close of the auction. Once you receive that alert, you will have the ability to rate the seller through the page displayed below. Only the winning bidder can submit feedback for an auction marked sold and the feedback must be submitted within 45 days of the auction closing. Only the winning bidder may submit feedback once per auction. Feedback may be submitted within 45 days of the close of auction. Only winning bidders with an active account may submit feedback.